Wanting to have short break before the rush leading up returning the US, truk and kath headed up to the "Top End" of Australia to check out the sights and warm up from the Sydney winter. 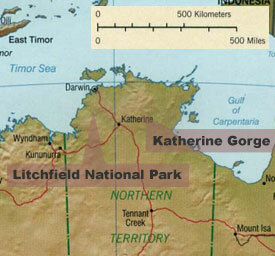 The Top End is a sparsely populated region. Consider that the territory's 200,000 residents have more than 520,000 square miles to live in, with half of those cramming themselves into Darwin, and, well, let's just say the place is pretty empty. It is a good place to go if you want to easily find a place to scream and have no one hear you. 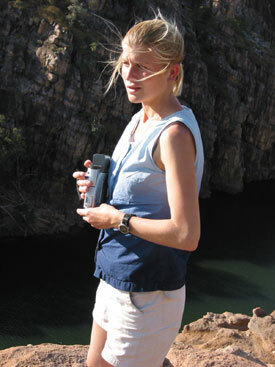 At the top of the state, there are several outstanding national parks, including the Kakadu World Heritage Area. This is "nature unplugged." The crocs really bite. Deadly snakes are all over the place. "Watch where you step" takes on a whole new meaning. After landing in Darwin, we got our feet wet with a quick daytrip to Litchfield National Park, which is only a couple of hours south of town. In preparation for a trip into Arnhem Land, we then took a bus down to Katherine to tour the Nitmiluk Gorge (formerly known as the Katherine Gorge before the land was returned to the traditional owners, who now manage the area). 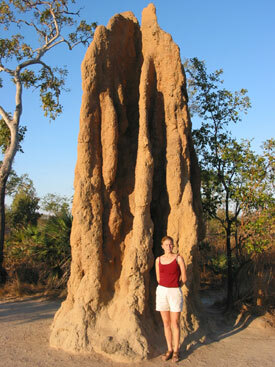 Katherine beside one of the giant termite mounds in Litchfield National Park. This is a cathedral-style mound, one of at least three different termite homes found there. (Some) objects on your screen are larger than they appear. Seriously, these things are huge. And tough. Giving one a swift kick will more likely result in a broken toe than a squashed termite. 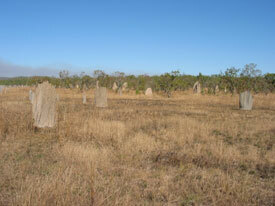 Mounds like exist to provide a home for termites, which build them up with the local dirt and their spit. They compliment the termite tunnels, which stream below the ground for up to 80 meters, which the termites travel to get food (such as grass), which they store in the mounds. During the Wet (the wet season), when the ground is often saturated, the little termites are safe and dry at the top of their mound. So the bigger, the better. These are magnetic termite mounds, which look a lot like gigantic teeth jutting out the ground, or a sparsely populated cemetery. They won't let you walk right up to these (they are for the busloads of tourists that stream down from Darwin every day). But magnetic termite mounds are all over the region, if you look around. Here is a close-up shot of a couple of them. 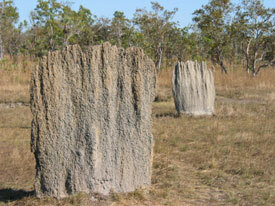 Magnetic termite mounds are flat on the sides, triangular in build, narrow at the top and only slightly wider at the base. Scientists guess that they are built this way so that the termites can more easily regulate their temperature by constructing mounds that catch a maximum or minimum of sunlight, depending on time of year. 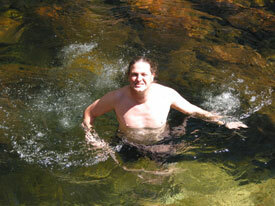 We managed to find a secluded waterhole at Walker Creek, in Litchfield. In this photo, truk splashes around, still innocent of the threat posed by the leeches that inhabit this water. Well, we didn't really see any leeches, but we were told about them by locals later, which is probably why the place was empty. An old abandoned tin mine at Bamboo Creek, in Litchfield. 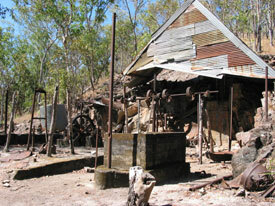 This place was pretty freaky, because there is still raw tin lying all around on the ground. It looks like some ripped up a tin can into little bits and spread it all over. 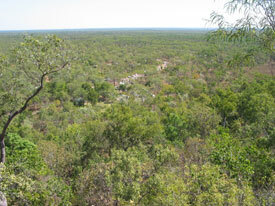 There are remanants of buildings from the settlement there, where most of the work was done by local Aboriginal people. 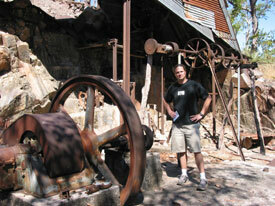 Here, truk poses beside the mill, which was driven by a local spring that flows out the hill above. Note: kath is not frowning in this photo. Rather, I made her look into the sun. 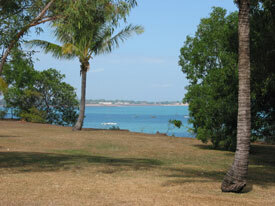 The Top End is a very sunny place during the Dry (the rest of the year when it isn't raining). She is just dipping her toes in Walker Creek, because she already guessed that no place could be this nice and not be filled with tourists. It just had to have crocs or leeches. 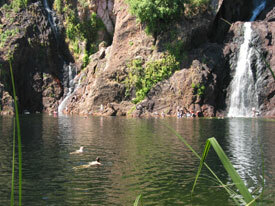 For many tourists that visit the Top End, the only place they swim (beside the $200/night hotel pool) is at Wangi Falls, still in Litchfield. There, two waterfalls make their way over the rock escarpments above and crash to a very pleasant and large (and cold) plunge pool. 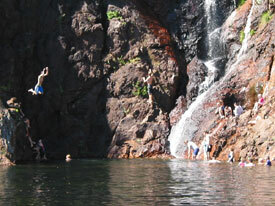 Wangi Falls brings out the "fun" in "fundamentally stupid." 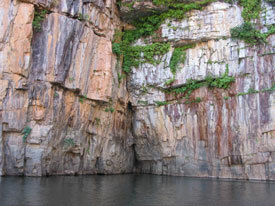 Here, you can see some guy checking out the water depth near the cliff face. One nice thing about Wangi is that you can climb up, right directly above it, crossing the river that feeds the two falls in the process. This is the view out toward the car park and over part of Litchfield. Note the cave directly above the falls. The rocks in this part of Australia are old. Like 1.6 billion years old. Many of these cliff faces jut out of the ground sideways, having been cracked and jutted around in different directions for eons. 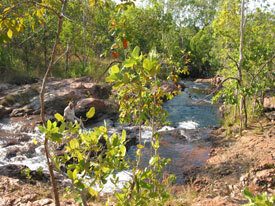 Buley's Rockhole is just a creek with a series of waterholes. 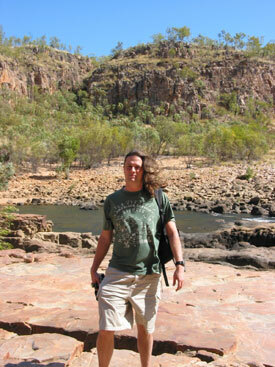 It is a very peaceful place to spend an afternoon, but we moved on, looking for a more secluded location. kath checking out the height at Florence Falls. The water that flows through Buley's Rockhole ends up going over Florence Falls, and when this picture was snapped, we were on our way down for a late afternoon swim. 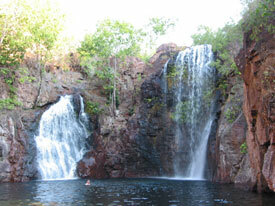 The two waterfalls at Florence Falls dump into a relatively shallow plunge pool. kath still maintained the water was too cold, but she did get in (and almost froze). Back at the YHA hostel in Darwin, it was postcard time. After a hard day of taking "death marches" with her husband, kath likes to curl up with a little cider and her address book for some correspondence. Fannie Bay, which looks back on the city of Darwin (as well as the keen MGM Casino with its killer "Aqua" room - which really redefines what you can do with blue paint, some soft lighting, and tropical fish tanks). 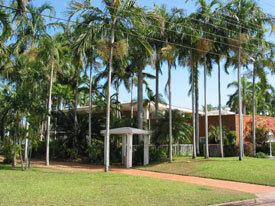 I would like to call this a typical Darwin home, but rather it is more like the a-typical Darwin paradise manor. Most of the truly typical Darwin homes blew away in one of the many cyclones that have ravaged the region, most lately in 1974, when the entire city had to be abandoned and rebuilt. This photo was taken especially for Joe Pennington, truk's pop, who is a rabid radio control model airplane pilot. By sheer luck, we just came across the place on our casual walk (read: Death March through the middle of the hottest part of the day). 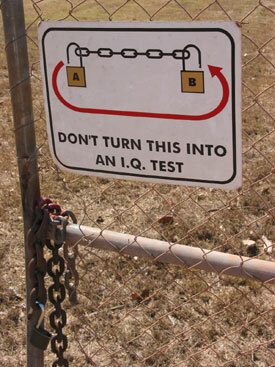 I guess a "Please Lock this Gate" sign wouldn't really work here. 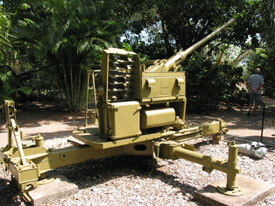 At the East Point Military Museum in Darwin, you can see war wares from various decades. If the Aussies had an anti-aircraft gun this nice in 1942-43, perhaps they would have suffered fewer losses from Japanese attacks on their supply lines and bases. 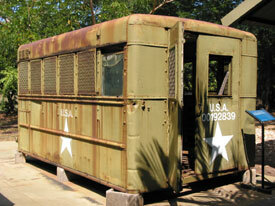 This US Army mobile workshop building (circa WWII) was dragged out of the jungle someplace. The inside was wrecked, but these building were crucial for making repairs when the army was on the move. 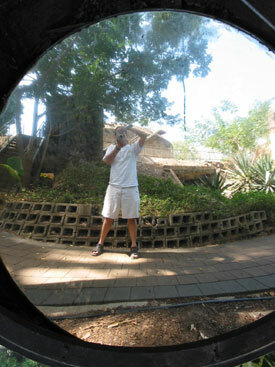 This is a mirror from one of the searchlights used to protect Darwin from Japanese dive bomber attacks at night. You can't fight a war without fresh water. And your better - best." truk burned to a crisp after the Death March and not writing postcards. 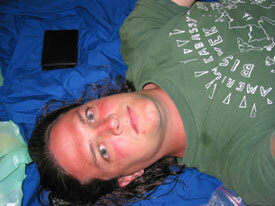 He is wearing his American Embassy - Bishkek t-shirt, which he has stunk up on 6 continents. 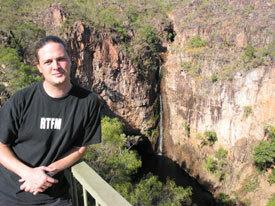 He is currently interviewing (trying out) replacements, including a Mainoru Station, Northern Territory, t-shirt that he got on this trip in Arnhem Land. We will keep you posted. 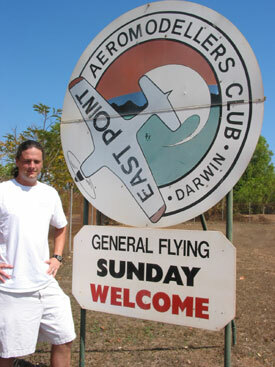 To get this shot, we actually had to get the tour guide to turn the whole 4WD around when we were almost back to Darwin. 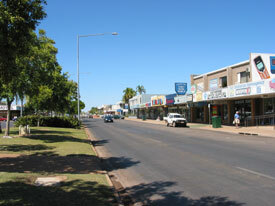 The main drag in Katherine, NT. If you follow the sign in the picture above, you will end up here, in the thriving metropolis. I mean, heck, they have a Red Rooster. And a Woolworths. 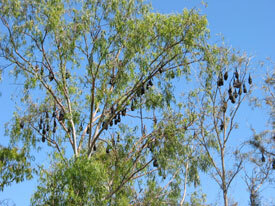 Bats hanging out at Nitmiluk (Katherine Gorge). While we waited in line to board the gorge cruise boat, the bats tried to catch some winks while fanning themselves in the heat and occasionally having noisy arguments. 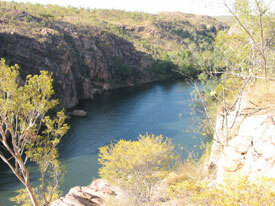 The Second Gorge at Nitmiluk really demonstrates the beauty of the place. 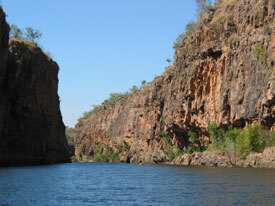 The water can be up to 80 meters deep here, having been carved out by the Katherine River for millions of years. 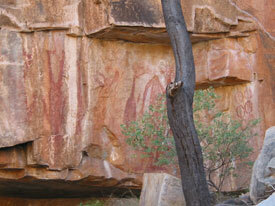 Any place this nice has got to have some Aboriginal art. Because of the abundant water directly around the river, folks have been spending time in this region for tens of thousands of years. 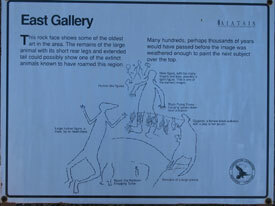 Nice signs are located at many of the more popular art sites, which can prove helpful in picking out the faded drawings from the natural colors in the rock. The Aboriginal art that we saw at Katherine probably did the same job as a McDonald's picture menu, letting people new the area know what kinds of tucker (food) is available in and around the river. 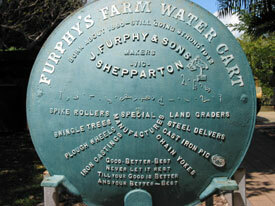 We visited the Top End during the driest month during the Dry, so the water was almost at its lowest point. 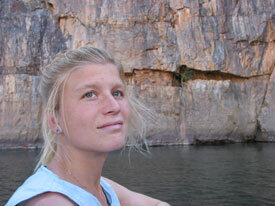 For that reason, we actually had to change boats when going between the First and Second gorges. This is truk, making that 500 meter trip in his trusty Bishkek t-shirt. 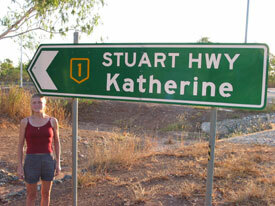 kath really liked the Second Gorge. See no sun! That is why she isn't frowning (or looking like she is frowning when she really isn't). Rock fractures litter the sides of the gorge, where rock plates have slammed into one another or broken in two a long time ago. 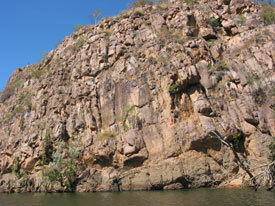 This photo shows off the ancient sandstone tilting into the water in the Second Gorge. You can hike above the First Gorge and check out the bend in the river. kath took some video up there. Note the diagonal rocks behind her that lean into the river. 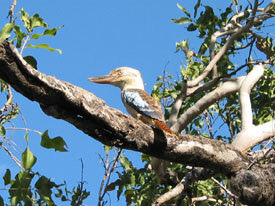 A hard-earned picture of a Blue-Winged Kookaburra. These little fellas, which look like living caricatures with their big heads and small bodies, are the cousins of the brown-and-white "laughing" kookaburras that live around Sydney. 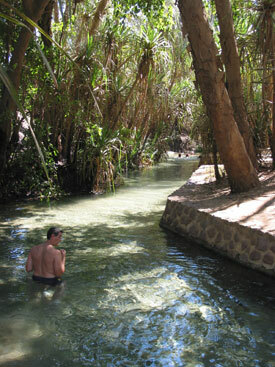 Katherine's favorite place in Katherine, NT: the Katherine Hot Springs, which really aren't that hot, and we've seen cleaner spring water, but, hey, in dusty Katherine during the dry, it really is an oasis.